I’d never heard of this novel until I noticed it up for sale online. The premise sounded reasonably interesting and it had a couple of positive bits of blurb attached to to the advert for it. So I thought I’d give it a try. Perhaps it is a now unfairly forgotten minor masterpiece? 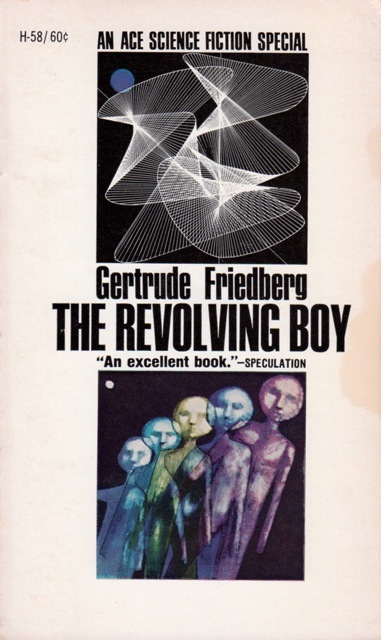 Starting this, I really had no idea what to expect from Gertrude Friedberg’s 1966 novel, her first full length science fiction novel. The premise is quite straightforward. 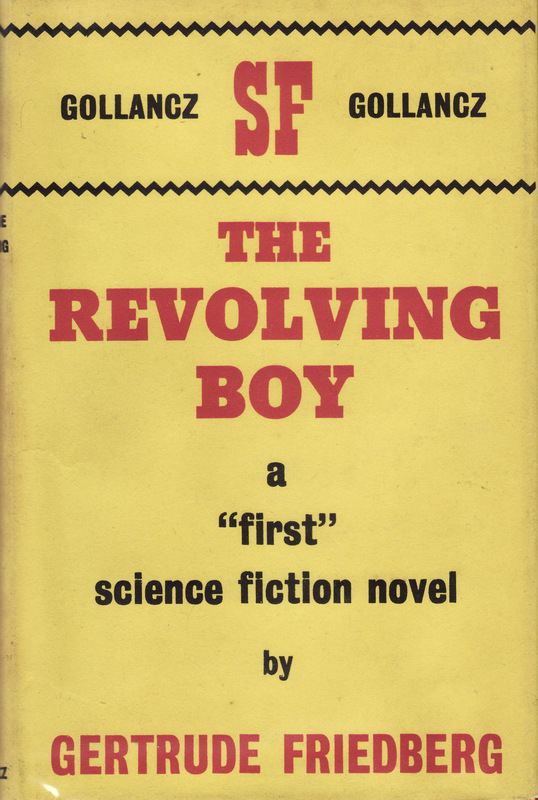 The revolving boy of the title, Derv Nagy, is blessed with an unfailing sense of direction. At any given time, he knows exactly where he is and this ability gives him a perfect sense of direction. This ability is compared to a classmate’s absolute pitch. 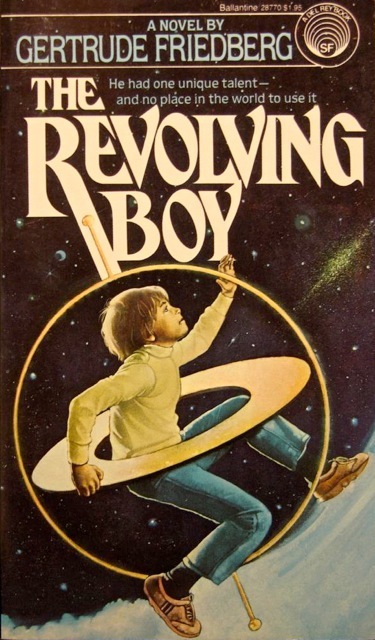 Though through the novel his parents had been aware that he was always able to successfully guide them to anywhere that they needed to go, it was his need to realign himself to compensate for his (and the planets) movements in space that really alerts them to his being unusual. This simple premise is used to tell quite a touching little story. His ability, though in of itself useful, is seen by his parents and teachers as being an affliction, rather than a gift. In the case of the teachers, it is simply because it makes his behaviour a little odd and unexpected, while for his parents it is because if anyone were to delve too deeply into the reasons for Derv’s odd movements and unexpectedly accurate sense of direction the truth about their lives would be revealed. This aspect of the novel is handled quite well. The idea itself is a nice one and the conclusion of the novel is a satisfying pay off for the build up. As the truth of Derv’s existence is revealed, it starts to become clear that his unusual ability isn’t an affliction to fight against (though it does offer a few barriers along the way), more he may hold the keys to a greater understanding of the universe and humanity’s place within it. For me, though, this is pretty much where the positive aspects of the novel end. Friedberg’s novel is not what one would call a stylish novel. This isn’t inherently a bad thing. Straightforward prose, so long as it isn’t tedious, can work. However, the fact that I had other issues with the novel meant that this lack of ambition in the writing highlights the faults of the novel and makes them all the more irritating. Firstly it has an annoying tendency to use pointless neologisms where a known word would have been equally as good; in fact in most cases it would have been infinitely preferable. For example, the narrative refers to a ‘wallochron’, ‘teleson’ and most-annoyingly the ‘air-warm’. Not to suggest that neologisms don’t have a place at all in genre fiction. Of course they do, used sparingly and with a sure hand. This novel wasn’t particularly crying out for them though. The novel is set just a few years from the publication of the novel (and therefore, in the past for us). Unfortunately, as Friedberg has decided to imagine a world which is in some ways more technologically advanced than these seventies and eighties proved to be while being oddly conservative. On the first page it’s noted that the fashions sported by the people of the beaches are a reaction to the excesses of the sixties. Neither of these things is necessarily a bad thing. There is pleasure to be had in reading novels which extrapolate and explore the consequences of future scientific discoveries and technological developments, I don’t think that this is the novel to attempt this. It certainly doesn’t even attempt to provide any analysis of technology or of social developments.. As the scientific and technological developments seem to be there more to prove that this is a SF novel than being integral to the narrative, I just didn’t feel that they added anything. More than getting things wrong the clunky technobabble, used too often to explain a piece of technology, just has the effect of bouncing the reader out of the narrative. This really detracts from what could have been an interesting, unusual, touching and deeply human story. I didn’t have any particular expectations of this novel, but I was hopeful that it may turn out to have been a neglected and under-read classic from the SF field. Unfortunately, this really wasn’t the case. An intriguing premise (and, in fairness, resolution) are let down by too little style marred by an unfortunate attempt to bolt on a lot of new technology to the story. Disappointing: look elsewhere for hidden gems. This entry was posted in Review and tagged gertrude friedberg, novel, sf. Bookmark the permalink. Hmm, the work was clearly not a success considering she never wrote another sci-fi novel… But then again, wikipedia tells me she’s primarily a playwright. The Ace cover is great! And the Del Rey cover — HAHAHAHA — utter crud. Oh, good god. I wish I had the Del Ray now. At least that would be a candidate for Good Show Sir! Yeah, I have to admit that the fact that this was her only SF novel did worry me a bit. But then I considered the fact that plenty of good female written SF disappears unfairly… Sadly that wasn’t the reason with this one. Bums. Yup, your review certainly displayed the averageness of the work… I wasn’t tempted in the least — hahaha! I really liked this book when I read it… in 1969… the summer after 8th grade. I took this novel differently. I feel that, while a simple narrative, it had something to offer in terms of unrequited love (resolved nicely); curiosity for the reader (resolved satisfactorily); and completeness of story (no sequel required). Yes the language was a little stilted, but I found it easy to go beyond that and bask in the concepts and joie de vivre of the characters. This was one of my favourite stories growing up. I am almost 59 years old, and, I read this book as a child. I loved !!!!!!!!!! It. I empathized with the boy, and at the end , I enjoyed the explanation. It was an enjoyable read, a good memory, and, a wonderful story . Good for the imagination. I never noticed anything wrong with the language, and I was 10 years old.